by Eugenie Fraser | Biographies & Memoirs | This book has not been rated. 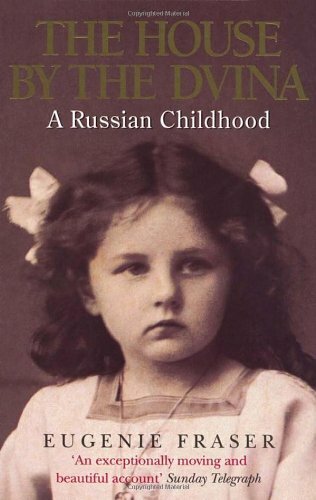 The riveting story of two families separated in culture and geography but bound together by a Russian-Scottish marriage includes the purchase by the author's great-grandfather of a peasant girl with whom he had fallen in love, the desperate sledge journey in the depths of winter made by her grandmother to intercede with Tsar Aleksandr II for her husband, the extraordinary courtship of her parents, and her Scottish granny being caught up in the abortive revolution of 1905. Brought up in Russia but taken on visits to Scotland, Eugenie Fraser marvelously evokes a child's reactions to two totally different environments, sets of customs, and family backgrounds. With the events of 1914 to 1920—the war with Germany, the Revolution, the murder of the Tsar, and the withdrawal of the Allied Intervention in the north—came the disintegration of Russia and of family life. The stark realities of hunger, deprivation, and fear are sharply contrasted with the adventures of childhood. The reader shares the family's suspense and concern about the fates of its members and relives with Eugenie her final escape to Scotland. I really liked Eugénie's story and I choose it for my April "One book a month offered 2017"
The book goes to Haugtussa. On its way to Norway. Thank you! I look forward to read this book.